So my wedding cake obsession of late has been fun and whimsical cakes covered in sprinkles. It’s not that I like eating sprinkles (I don’t – it’s the texture) but I looove the way they look on cakes. And when they’re used on wedding cakes it is so unique and non-traditional that the cakes always go in the “win” column. Today’s featured cake is no exception. 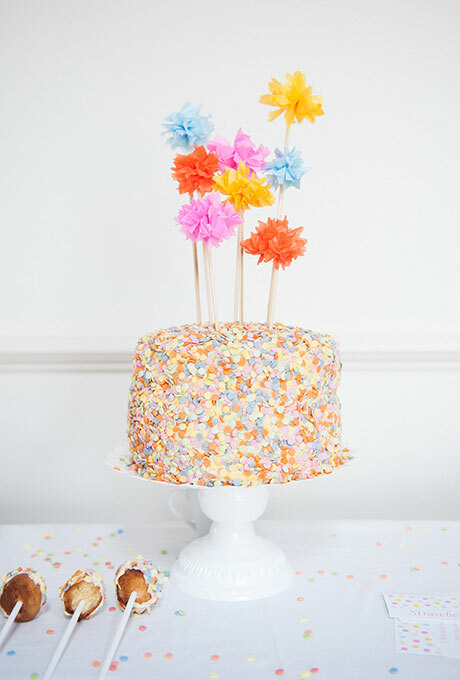 I love this simple one-tier cake with confetti-type sprinkles. And the added pop of color from the paper flowers is perfection. This cake would be perfect for a small reception, or for a bride-and-groom-only cake (if that’s a thing..if it isn’t I just made it a thing!). Or you could get really crazy and have mini versions (cupcakes maybe) created for all the guests. You’ll find this fun wedding cake here.